Today, Michel Foucault (1926 – 1984), as a theorist of post-structuralism, is one of the most well-known sources of conceptual reflection in cultural history. In current cultural-historical debates, his notions of ‘discourse’, ‘archeology’, ‘genealogy’ or ‘governmentality’ are amongst the most freuently used ones.1 They are used to tell the ‘histories’ of very different subjects and topics, from a broad variety of perspectives. All those seemingly Foucauldian macro-, meso- and microstories of historical reality share, despite their different narratological subjects and objects, the ontological background of post-structuralist theory. However, we have to be aware that today’s common understanding of a ‘Foucaldian’ methodology in cultural history, is not exactly and ‘originary’ Foucauldian, strictly clinging to the philosopher’s intentions. Foucault claimed himself to be a ‘positivist’2 who examined discourses as positive and empirical formations of performative ‘speech acts’ in history. Thus, when telling cultural history by using Foucauldian concepts and methods, such as ‘discourse analysis’, ‘archeology’ or ‘genealogy’, we have to be aware – and honest to ourselves – that we use and re-use, hence modificate these notions, depending on our own specific interests of research. So, maybe it is unfortunate to speak and write of ‘Foucauldian’ thought in cultural history. 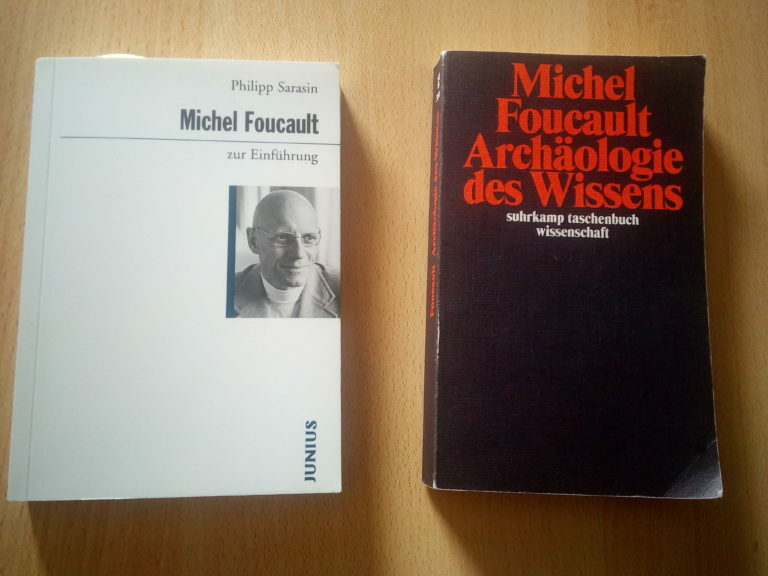 Probably, to define current theorizing in cultural research as an ‘Neo-Foucauldian‘ framework would maybe be more accurate: we overworked Foucault’s theories by projecting our own historiographical demands upon his work. Supposedly, Foucault himself, a strongly pragmatic and non-systemic thinker, would not mind. He wanted his theoretical notions and concepts to be seen as a ‘toolbox’, from which everyone should take the tools and notions she or he needed; adapting them to her or his needs in analysis.4 Exactly, this is the actual and strictly Foucauldian approach: it is not an approach that glorifies (de-)construcitivism but an endless play and re-play of rethinking theoretical terminologies. The actual ‘constant’ (Foucault would strictly avoid this notion) in Foucauldian thought is a pragmatic and ontological one, a specific ‘flexible’ perspectivism. All through his professional life, his work was an examination and cyclic re-examination of the theorectial notions he had used before. So, actual Foucauldian cultural theorism is one which puts terminoligical self-reflection into his main focus. It is a perspective which, again and again, returns to its core notions, re-works and over-works them, making them better suitable for its relevant empirical needs. Taking up my differentiation between ‘Foucauldian’ and ‘Neo-Foucauldian’ thought, could be a way of making theorizing in Metal Music Studies more accessible and clearer – by being more exact and self-reflexive, taking the self-critique of terminology as a more important point. When speaking of ‘discourse’, ‘archeology’, ‘genealogy’ or ‘governmentality’, we should exactly define how we use these notions; maybe giving an exact point of reference in Foucauld’s own texts, clarifying which phase of Foucauld’s own self-critique of theory we intend to operationalize. This entry was posted in Artikel, Fachwissenschaftliche Artikel and tagged Cultural History, Discourse Analysis, Focault, History, Metal Music Studies, Michel Foucault. Bookmark the permalink.